You are currently browsing the tag archive for the ‘Data visualization’ tag. Fig. 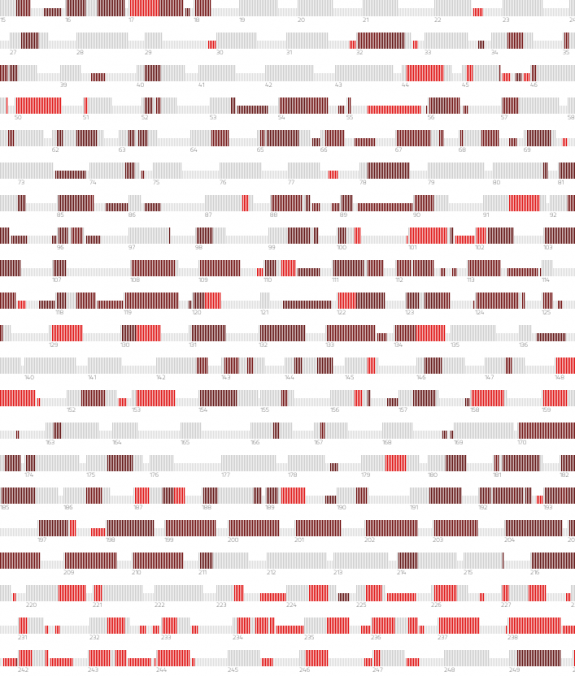 – Gregor Aisch visualized Guttenberg‘s dissertation, highlighting the plagiarized portions. The dark red represents complete or masked plagiarism, while the lighter red represents different categories of plagiarism. Longer bars are for normal text, and small bars represent footnote lines. On Monday, Feb. 28, Germany’s defence minister, Karl-Theodor zu Guttenberg, resigned after admitting that he plagiarized his PhD dissertation. It followed an unprecedented outpouring of anger from Germany’s academic community when it was shown that half his doctorate was written by others. Further analysis showed more than half the 475-page paper had long sections lifted from other people’s work. Once touted as a future chancellor, he was variously branded “Baron Cut-and-Paste“, “Zu Copyberg” and “Zu Googleberg” by the German media as the scandal developed. At least 23,000 academics signed an open letter to chancellor Angela Merkel urging her to sack him (source: Metro.co.uk). Video – “Journalism in the age of data” is a 50-minute documentary by Geoff McGhee on information visualization, data as medium, and its use in journalism. Produced during a 2009-2010 John S. Knight Journalism Fellowship at Stanford University. ciência e da arte” ~ Manuel Teixeira-Gomes, Escritor nascido em Portimão. 7º Presidente da Rép. Portuguesa, in Carnaval Literário, 1938. Journalists are coping with the rising information flood by borrowing data visualization techniques from computer scientists, researchers and artists. Some newsrooms are already beginning to retool their staffs and systems to prepare for a future in which data becomes a medium. But how do we communicate with data, how can traditional narratives be fused with sophisticated, interactive information displays? For more, watch the full version with annotations and links at datajournalism.stanford.edu.